Drop by Central Place Plaza May 18 to meet artist Alicia Eggert and interact with her work "You Are Magic"
UPDATE: DUE TO THE RAINY WEATHER, WE'VE HAD TO CANCEL THIS EVENT. PLEASE JOIN US LATER THIS SUMMER WHEN THE ARLINGTON ART TRUCK WILL BRING ARTIST MARCELLE KRIEBEL AND "COLOR YOUR GARDEN" TO ROSSLYN. STAY TUNED FOR DETAILS! The truck was one of only 1,000 projects nationwide to receive NEA funding. It's been on the road since April and it's definitely attracting lots of positive attention. You can see it yourself when it arrives at Central Place Plaza, 1800 North Lynn St., on Friday, May 18, where it will be parked from 11 a.m.-2 p.m. along with passengers Miss Northern Virginia Caroline Weinroth and artist Alicia Eggert. Eggert will talk with visitors about her large-scale, interactive, inflatable sculpture, "You Are Magic," which will be traveling with the truck. Rosslyn's visit from the truck is brought to you in partnership with Volunteer Arlington. Texas artist Eggert developed "You Are Magic" specifically for the Arlington Art Truck. This interactive inflatable sculpture is designed to inspire wonder and evoke the power of collaboration. When two people touch the handprint sensors and hold hands across the platform, the deflated sculpture comes to life. The inflatable fills with air, growing larger the longer participants hold hands, expanding into the words "You Are Magic." But as soon as they release their hands the circuit is broken, and the sculpture deflates into a crumpled pile of fabric on the ground. You will be able to interact with the sculpture yourself when you visit the plaza on May 18. Alicia Eggert is an interdisciplinary artist whose work focuses on the relationship between language, image and time. A TED fellow, she's been exhibited at notable institutions nationally and internationally, including the CAFA Art Museum in Beijing, the Triennale Design Museum in Milan, the International Symposium on Electronic Art ISEA2012 at the Albuquerque Museum of Art and History, Sculpture By the Sea in Sydney, Australia, Artefact Festival in Leuven, Belgium, and many more. To read a longer bio, click here. 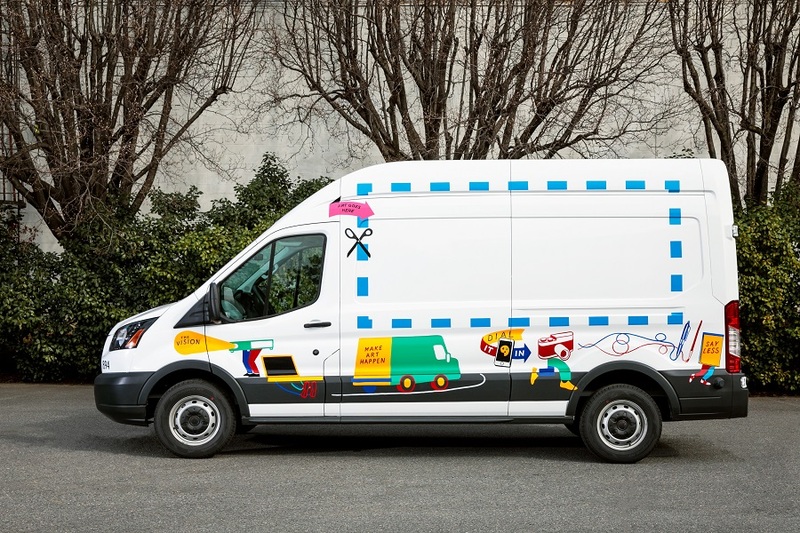 "With the Arlington Art Truck, we're bringing contemporary artists out onto the streetscape of Arlington with curated projects developed specifically for Arlington County," says Cynthia Connolly, special projects curator for Arlington Cultural Affairs. "People can learn about the projects and interact with the artists on site. The artists always travel with the truck. The ones we've chosen like to interact with the public and share what they know." Connolly, who is a well-known photographer and artist herself, believes the Arlington Art Truck has great value because it brings art into our everyday routines. "It's important to disrupt our everyday pattern as we go to work or shop. It's good to remind ourselves that creativity is an important part of our lives, and that our routine is not the only thing that matters," Connolly says. "Art is the medium to remind us of the importance of creativity. We can rethink our lives, asking ourselves: 'Is there a better way to live?' 'How can I change my life for the better?' We need to keep art in the dialogue." Note that this event will be canceled if there are high winds or rain. Photos above: Alicia Eggert's "You Are Magic" will be at Central Place Plaza May 18. It will be traveling with the Arlington Art Truck. On the road since April, the art truck's mission is to take art out of museums and bring it to the people. 1. Note that most information in the article comes from a press release produced by Arlington Economic Development. Information about Alicia Eggert and "You Are Magic" comes from the artist's website.